This tutorial will explain how to create soft edges on an image in Adobe Photoshop so it will blend into the background. 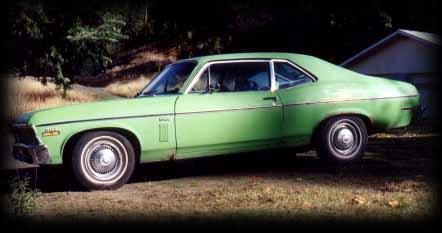 We will be using a photo of a 72 Chevrolet Nova and giving it a black background as shown below. Copy the image so you still have the original, and work from the copy. Before cropping the image leave enough extra background so you can feather the edges. Use one of the selection tools to highlight the area you want to feather. Use the rectangular marquee tool for square or rectangular borders, or the oval marquee tool for rounded borders or the lasso tool for odd shaped images. In order to highlight your border evenly on all edges turn on the ruler and measure the same amount in the numbered guide on both width and height. This image is set for inches and the border is set for 3/10 of an inch on each corner. Your border may be more or less. You will be using copy and paste to place the image on another background but first you need to set the background color of the new image. The background color needs to be the same as the color of the page you are going to paste it on, i.e., you need to chose a black background for a black page like on this image. Click on the the background tool and choose the preferred color by clicking on a color in the Photoshop color pallet. If you'd rather use a color not listed in the color pallet you can enter a hex code for the color. If you want to match the background of your page use the eye dropper to get the hex color of your background and then type in that number. To soften the edges, go back to the highlighted image and choose "select / feather" in the menu and then choose a feather radius of 4 to 12 pixels to determine the width of feathered edge. You may not see a change, but just continue to the next step. Now choose "edit / copy" and then "new". 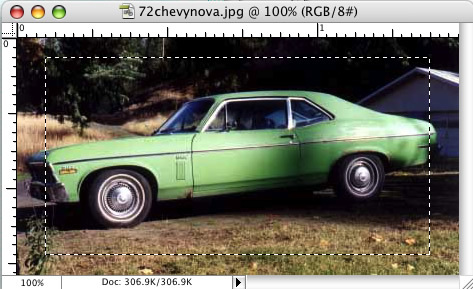 Photoshop will automatically open a new image box the same size as the one you copied. Make sure you specify the color of the background. Now choose "edit / paste" and the feathered image should show up in the box you just opened.